Dubai: As she works now with the Madrid Club of former leaders and the Clinton Global Initiative of former presidents, Chandrika Kumaratunga keeps up to date with the developing political situation in the island nation of Sri Lanka. Her’s is a tragic story, one of a family so closely associated with the political ascendency on the island — but also one so deeply scarred by the bloody events of the three-decade long civil war as the LTTE — the Tamil Tigers — fought furiously for independence for the northern Tamil-dominated Jaffna Peninsula from the Sinhalese-dominated south. It’s four years this month that the bloody conflict finally ended and even then the circumstances of the final chapter remains shrouded in controversy amid accusations that the government forces abused civil rights and indiscriminately killed civilians — a charge Colombo and current President Mahinda Rajapaska strenuously deny. Chandrika was born into the political Bandaranaike dynasty in 1945 where her father, SWRD Bandaranaike was a government minister and, as she was being educated at St. Bridgit’s Convent in Colombo, he was climbing the rungs of power, becoming Prime Minister. Her grandfather had also been the Chief Minister and adviser to the Governor of Ceylon during the waning days of the British empire and its tear-shaped colony at the foot of India. As she turned 14, her father was assassinated, with her mother, Sirimavo Bandaranaike succeeding him to become the world’s first woman Prime Minister. His death marked the first time that Chandrika had been physically and emotionally touched by political assassination — and it was a theme to which she would become all too sadly associated. While many portrayed her mother as politically naive and merely a housewife, Sirimavo was anything but — she was astute, dividing her enemies with sweeping social reforms and managing to largely keep a lid on the Tamil issue — courting a close relationship with India. She declared a state of emergency shortly after coming to power to successfully stymie a Tamil civil disobedience campaign and, over the next few years, facilitated the repatriation of an estimated 650,000 Tamils. For Chandrika, studies at the University of Paris and exposure to and participation in the student riots of 1968 cemented her social conscience and confirmed her commitment to a future in politics. She returned to the island in 1974 and became active in the Sri Lanka Freedom Party, her pedigree giving her fast access to the top echelons of the organisation and helping it secure land reforms and established more effective collective farms. In her private life, she married dashing film star Vijaya Kumaranatunga, with a string of hits under his belt and a keen interest also in political affairs. Together, they had two children — both now living overseas — away from the land that claimed their father’s life in assassination in 1988. For a while, Chandrika had been active in and supported Kumaranatunga’s Sri Lanka Mahajana Pakshaya — the People’s party. His assassination, though, forced Chandrika into exile, living in London and working for the World Institute for Development Economics Research and the United Nations University. Kumaranatunga’s funeral was the largest gathering on the island an, according to some experts, the largest ever for a film star. After three years in exile, she deemed it safe enough to return to Sri Lanka even though the LTTE rebellion in Jaffna was gathering steam. Within two years of coming home, Chandrika was elected chief minister for the western province in a landslide 1993 election, setting her on course for the higher offices. A year later she was elected Prime Minister at the head of a People’s Alliance government. By November she was elected president, determined that she would end the civil war by finding common ground with the LTTE. For a while, her overtures to the Tigers seemed to work, but a series of bombings ended any hope of a political fix. With steely determination, she pursued a more aggressive military policy against the Tigers, setting herself as an even greater target for the separatists. It wasn’t a case of if they would strike against her — but when. That attack came on the last day of campaigning in ther December 1999 presidential election when a bomber struck at Colombo Town Hall. She lost her eye in the explosion and narrowly escaped more serious injury — but she won the election, handing defeat to Ranil Wickremasinghe and his UNP. Her second term, however, was marred by political infighting with Wickremasinghe who became Prime Minister. He favoured a softer line with the LTTE and, with the help of Norwegian and Canadian intermediateies, signed a ceasefiire in early 2002. 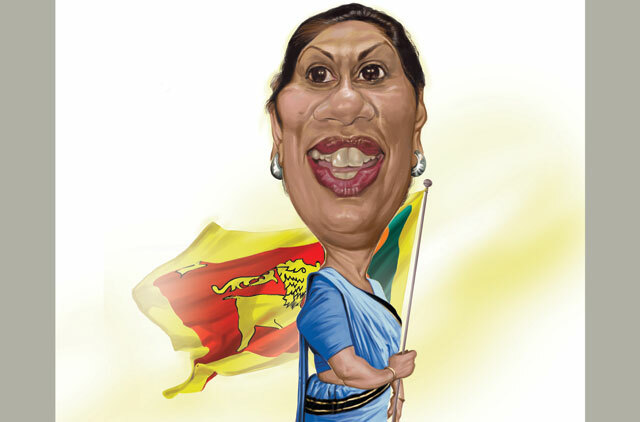 For Chandrika, having lost her husband and father to political killings, peace with the LTTE wasn’t acceptable, setting her on course to dismiss Wickremasinghe which allowed Rajapaska to become Prime Minister and eventual president. Her final days as president were marred by accusations of mislhandling the relief and rebuilding operations after the Boxing Day tsunami of 2004. But at least she survived the turmoils of office — which given her family’s sad history — says most.